Damas Flowers has wonderful bouquets, such as: Berry Crush, Blissful Flower Bouquet, Buttercup Bouquet, Clustered Bridal Bouquet, or many others made in a green color. That will be a good addition for those, who like green color. Why to choose green color, for a bridal bouquet? The answer is very simple: this juicy shade of warm green is a very positive and life-affirming color. Therefore, any inclusion of hue color will only benefit the design on a bridal bouquet. The choice of green color flowers are quite wide. 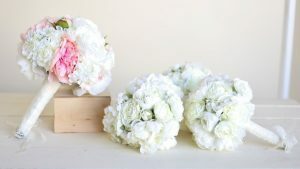 It can be Ranunculus, tulips, chrysanthemum, viburnum, carnation, gladiolus, or orchid. 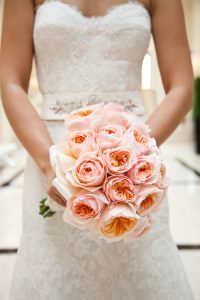 Another trend, of bridal bouquet color design, is pink, coral, and all shades of peach colors. These bouquets way bring freshness to bridal’s style. 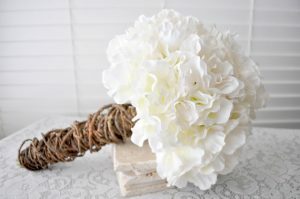 Damas Flowers can offer you amazing colorful dream bouquets, such as: Atlanta Romantic bouquet, Beauty Magic Wedding bouquet, Bloomsbury Hue Wedding bouquet, Brill Bridal bouquet, or many others. These bouquets look truly fashionable, special, and very “floral”. As for brides, these trends are win-win combination, as each of them can find their own unique combination of colors, and design. At this point, it is necessary to consider the basis color, wedding decoration style, bride’s dress. 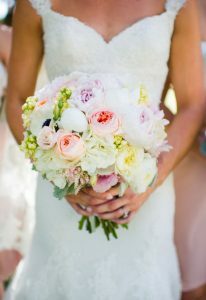 Good color palette, of a wedding bouquet, can only emphasize the natural beauty of a bride. 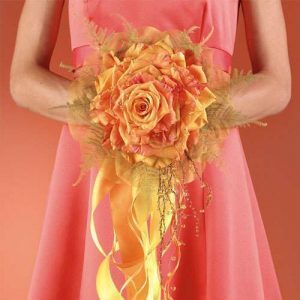 If you don’t know what bridal bouquet will suit you – ask Damas Flowers. Damas Flowers are specialists in wedding arrangement! Dream Marriage – Wedding in Dubai!